(Nanowerk News) In a discovery that may prove important for cognitive science, our understanding of nature and applications for robot vision, researchers at the University of Adelaide have found evidence that the dragonfly is capable of higher-level thought processes when hunting its prey. The discovery, to be published online today in the journal Current Biology ("Selective Attention in an Insect Visual Neuron"), is the first evidence that an invertebrate animal has brain cells for selective attention, which has so far only been demonstrated in primates. 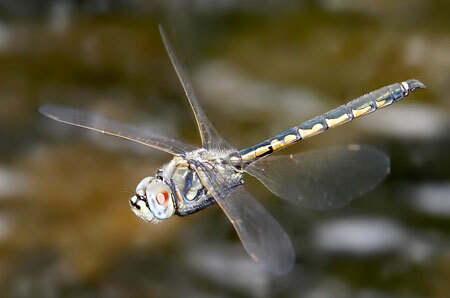 A Tau Emerald dragonfly (Hemicordulia tau) in mid flight. Dr Steven Wiederman and Associate Professor David O'Carroll from the University of Adelaide's Centre for Neuroscience Research have been studying insect vision for many years. Using a tiny glass probe with a tip that is only 60 nanometres wide - 1500 times smaller than the width of a human hair - the researchers have discovered neuron activity in the dragonfly's brain that enables this selective attention. They found that when presented with more than one visual target, the dragonfly brain cell 'locks on' to one target and behaves as if the other targets don't exist. "Selective attention is fundamental to humans' ability to select and respond to one sensory stimulus in the presence of distractions," Dr Wiederman says. "Imagine a tennis player having to pick out a small ball from the crowd when it's traveling at almost 200kms an hour - you need selective attention in order to hit that ball back into play. "Precisely how this works in biological brains remains poorly understood, and this has been a hot topic in neuroscience in recent years," he says. "The dragonfly hunts for other insects, and these might be part of a swarm - they're all tiny moving objects. Once the dragonfly has selected a target, its neuron activity filters out all other potential prey. The dragonfly then swoops in on its prey - they get it right 97% of the time." This video shows a dragonfly on the hunt for prey - at normal speed and then in slow motion. The dragonfly hovers while it searches for prey, moving its head and then repositioning its body, ready to pursue a target. When a target is identified (in this case a small fly), the dragonfly locks on and ignores all other potential targets. It swoops up and catches its prey. Associate Professor O'Carroll says this brain activity makes the dragonfly a more efficient and effective predator. "What's exciting for us is that this is the first direct demonstration of something akin to selective attention in humans shown at the single neuron level in an invertebrate," Associate Professor O'Carroll says. "Recent studies reveal similar mechanisms at work in the primate brain, but you might expect it there. We weren't expecting to find something so sophisticated in lowly insects from a group that's been around for 325 million years. "We believe our work will appeal to neuroscientists and engineers alike. For example, it could be used as a model system for robotic vision. Because the insect brain is simple and accessible, future work may allow us to fully understand the underlying network of neurons and copy it into intelligent robots," he says.